There is nothing better than reading a post that by the nature of its content challenges you to really reassess your thinking. This is where on the one hand a part of me is left nodding in agreement, but then a part of me is left unsure what it means for my own practices. I have read two such posts lately, Jon Andrews reflection on education cheeserolling and Dan Haesler’s question of disclosure. Andrews considers the tendency for many to simply play a game of follow the leader with little awareness of what we are actually following and who is actually leading. A point that Richard Olsen captures this so well in his post on research. 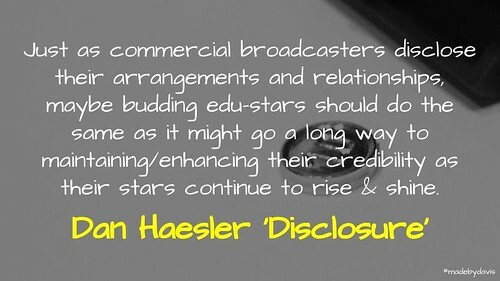 Haesler on the other hand puts the spotlight on disclosure. His point is about being clear about any gifts or donations that you may have received from companies whose products you may be writing about. Even though Haesler said that he had no gripe with people actually receiving such kickbacks, this post left me with more questions than answers. I write a lot about Google, I am a Google Certified Innovator. However, beyond providing the opportunity to spend a few days learning in Sydney a few years ago and a badge, I have never received any products or kickbacks. If you click this link I will not receive a thing, but you can sign up to Reclaim Hosting too and like me experience their awesome support. I have reflected on Adobe Voice (now Spark) quite a bit, however, the offer of Tim Kitchen to come to my school only after I had published my posts, while the free subscription to Adobe Cloud was a part of becoming an Adobe Campus Leader. I have presented at a number of conferences, including Leading a Digital School and GAFESummit. This often comes with free entry. Although there is no expectation as to what this means, however there is encouragement to share out with your network. To be fair, I have written about a lot of edtech products, whether it be TouchCast, Thimble, Blogging or Microsoft OneNote. I have not recieved any benefits from these companies. I probably (perhaps cynically) assume that anytime someone is spruiking a product (via blog or tweet etc) that there is either an existing or a desired commercial relationship. This is especially where my ‘spidey-senses’ appear when a tweet uses @product or a hyperlink. I have written about my ‘why’ before. However, Box’s comment leaves me doubting myself. Maybe deep down I am just fooling myself. Maybe there is a part in all of us, even Steve Box, that wants to be a thought leader held up in the limelight. Of course, you can say no, just as I do, but do you really know? So what about you? What are you disclosing? I would love to know. How Are You Disclosing? by Aaron Davis is licensed under a Creative Commons Attribution-ShareAlike 4.0 International License. Full disclosure…I hope to reap the rewards of an engaged dialogue and thought provocation. I hope all the discussion is a nice chance to reflect on the ‘why’ as you mentioned. If the why comes from the right place, people know it within. @mrkrndvs @danhaesler @richardolsen @Obi_Jon_ Box in lights. Or Lights in Box? Thanks for such a thoughtful response, it’s great when you know 1) people are reading and 2) they care enough to think about it… so thanks! FWIW the vast majority of your question pass the “gut feel test” don’t they? It’s also worth noting that since my blog post, several “highish” profile blogs have changed their wording despite previous claims that they never received anything. Thanks again for reading, writing & responding. Thank you the link Dan, it was helpful. I am still left wondering about the Kindle book that has been reduced to $0 for a day (often to get it trending in the charts). If this is public and open to anyone, do I need to disclose? It is all so interesting. Has me questioning what I actually choose to blog about. @mrkrndvs 2 months after #satchatOz, I received free book from #satchat founders. Honestly, I think I earn it~3 yrs of Saturdays 4 ? of Ed.